Yet again, friends are coming to the rescue. Today Pither has done us proud with a review for 'the boys' - thank you Pither. I recently saw and totally fell in love with the trailer for Steven Speilberg’s upcoming movie, War Horse. That gorgeous cinematography of that horse galloping in slow-motion across no man’s land while the shells land around it.... 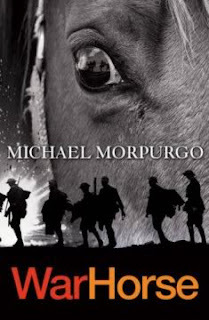 When hunting out reviews, I discovered that the movie is based on a book of the same name by Michael Morpurgo. In the interest of full self-disclosure, I’m a rabid Black Beauty fan. I picked up this book expecting it to be similar, and of course in some ways in was, but in others the tone feels totally different. A bit more focused on the action than the characters, I would say, a less self-reflective tone. You follow in first-person, (or would that be first-horse?) the life of a Devon, UK farm horse called Joey as he starts out on the farm and learning the horsey ropes of life with his human-BFF by his side, Albert. The First World War is soon started, and what I didn’t realize but makes sense, is that farmers were strongly encouraged to give up their horses for the war effort. Joey goes through the rigors of training and is shipped overseas with his horse-BFF, Topthorn. The book takes you through the entirety of the war from Joey’s perspective, starting off with the British forces but ending up with the Germans. I won’t say too much as I don’t want to give any spoilers, but his journey is an interesting one. I found the action moved fairly quickly and it was a face-paced book, a good choice for reluctant readers, especially with the movie tie-in. Considering the action goes from about 1910 to 1918, it never dragged yet never seemed rushed. War is portrayed as a rough and dirty slog in the cold and mud, not full of trumpets and glory. The war is seem from the ultimate foot solder’s perspective, that of the horse. He doesn’t care who wins the battle or what goes on in the war, he simply wants to survive the shellfire and smoke and be treated with respect, care, and gentle handling. “..and he [the German] picked up the rope again and handed it to the Welshman. As he did so, he held out his other hand in a gesture of friendship and reconciliation, a smile lighting his worn face. Overall I quite enjoyed War Horse. It made me pick up my copy of The Animal’s War by the Imperial War Museum to find out more about how horses and other animals have been used in warfare. It could work well as an ISU for this reason. It was a quick and interesting read, and would work well for students in a hurry, reluctant readers, young fans of warfare, or people who are interested in a unique perspective on the First World War.